Can you believe we are just over a week out from Christmas? This month has flown by already and the next thing we know the New Year will be upon us. Before that happens I want to take a few minutes and enjoy the holidays. For the next few days I wanted to share some kid crafts with you to get them excited for the big day. 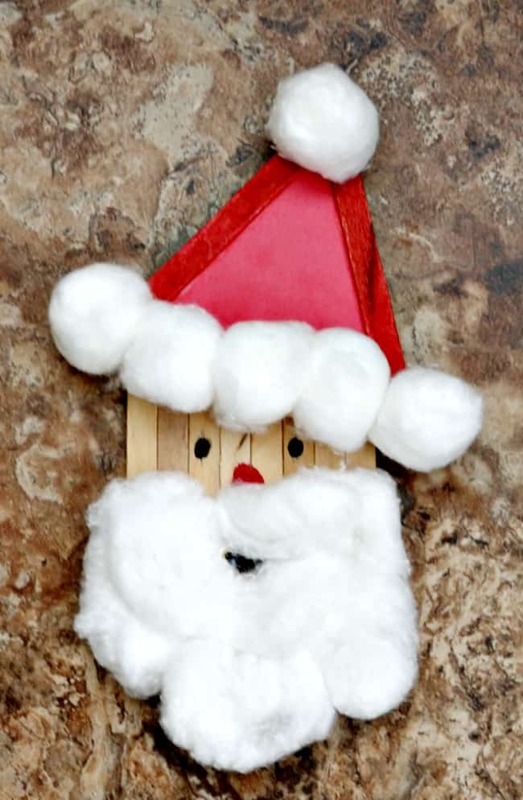 Today’s craft is a popsicle stick santa. Be sure to pop back in tomorrow for another one. Start off by painting 2 craft sticks red either with craft paint or a red marker. If you want to make the whole process easier, especially if you are crafting with a whole group of kids then you can purchase already red craft sticks. Glue on 8 plain craft sticks to your card stock or cardboard. I glued them in a v shape so that his beard would have something to glue to. It really doesn’t matter what you use for the backing just as long as it is strong enough to support the sticks. Also make sure that you cut your backing so that it’s not longer or wider than the Popsicle sticks. Allow to dry! 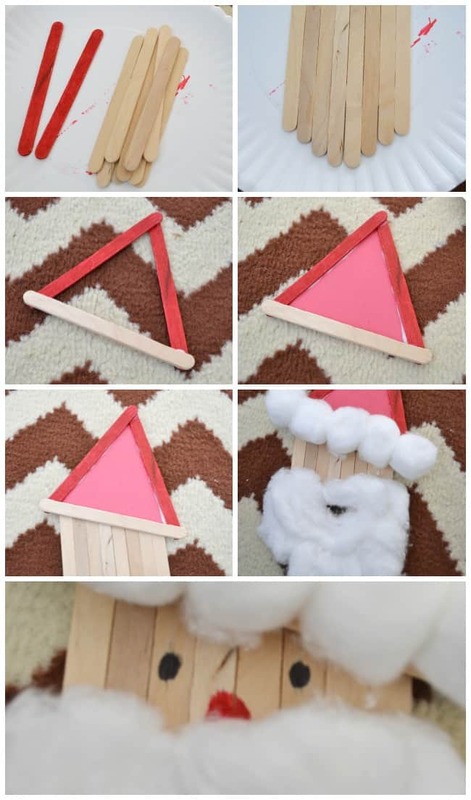 While you are waiting for the Santa head to dry you can glue together his hat using the 2 red sticks and 1 plain stick to create a triangle shape. Allow to dry! Once the hat is dry cut out a piece of red construction paper to glue to the back. Now you are ready to attach the hat to the Santa head. I tilted mine side ways just a little but you can do it however you please. Once the hat is dried to the Santa head you can then begin gluing on cotton balls for his beard and hat. For his beard pull pieces apart so that it is spread out a little. Pull a little piece apart so that you can see his little mouth as well. You will need about 10 cotton balls per Santa. The last step is to draw on a mouth, eyes and nose. If you want to turn him into a magnet I recommend a .75 inch adhesive magnet to hold it up. You could also attack some ribbon and turn him into a ornament. 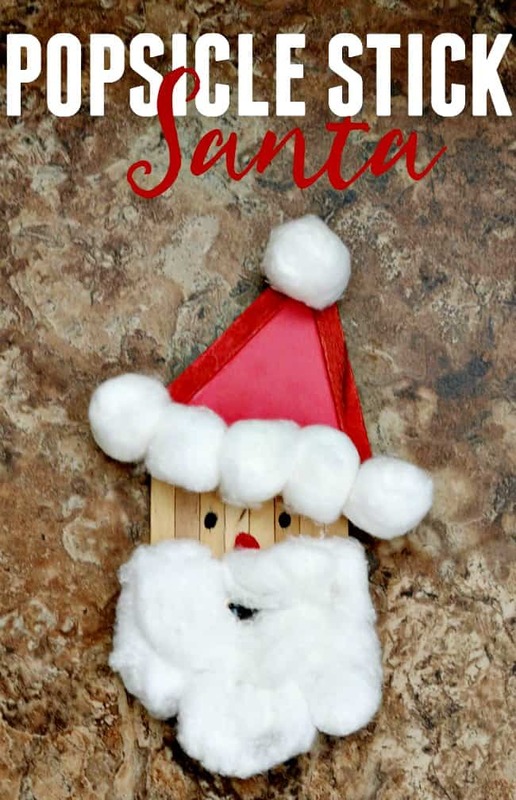 Looking for more Christmas craft ideas or Popsicle Stick Crafts?